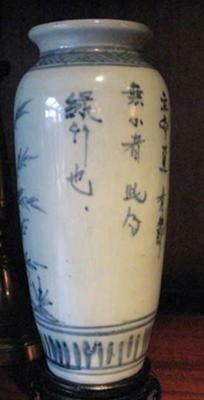 blue and white vase old? Hello, Need some advise at this one. I'ts very hard to figure out if an item is old, or made look as old. 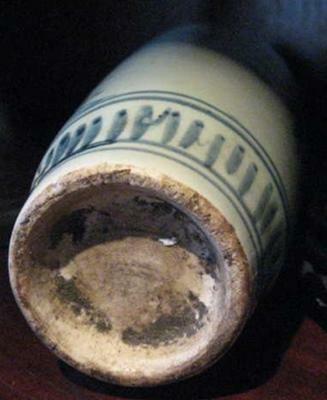 This vase has no marks (what it even makes more difficult), Does an Antique item allways has a Mark? I have read a lot of buying antiques (porcelain)and the things you have to take a close look, but it still is very difficult, can someone advise me on this one? and does anyone mean wat the charachters mean? I guess it would be Peter:-). 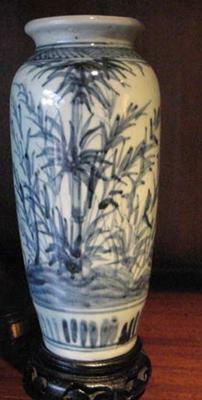 Comments for blue and white vase old? It IS difficult to tell whether it is old or fake, sometimes. This vase body looks old, too old. And, the crude painting and the fact that the painter didn't seem to know how to paint bamboo properly, it all causes doubt. The band decoration at the foot is also crude. If you did not buy it yet, don't... better don't. It could be a fake.